Every year in December, we plan our year end trip to take advantage of the company shutdown that mandates us to utilize a week of time-off. Last year we had the Rann Of Kutch trip planned out well in advance and the bookings were confirmed in August/September timeframe. This year was a bit different though, after the long vacation in August we didn’t really want to spend another two weeks out on a driving holiday. We were not even sure we’d want to go out in December, so we just kept our plans open and had no bookings etc done. It was only in the early part of December that we finalized that we’d go out at least for one week if not two. Getting a booking for the last week of December is a big deal, places are usually running full and pricing is at its peak. Not that we didn’t know it already, but we still wanted to give it one last try and see if there’s any economical and good holiday destination for us to visit. A lot of places were taken into consideration, from Goa, Kerala, Assam, Andamans and even Sri Lanka, almost everything we wanted to cover was evaluated. Either it was going beyond budget or there was simply no availability at almost all places. Sri Lanka was a strong contender since tickets were still going cheap, but stay options weren’t all that cheap (atleast the ones I could find on the internet). If it were any other time of the year, I wouldn’t mind taking a chance and landing up without prior bookings, but last week of December isn’t a good time to do that so we decided to drop the plan. It must be very obvious by now that we prefer remote locations to busy hill stations or crowded cities – the lesser the number of people, the better the location! I personally like natural creations versus man made wonders – I feel mankind has basically ruined the landscapes with what we think are aesthetic structures and marvels of engineering etc etc. The holiday should preferably have some element of wildlife – definitely not the zoos but not just the national parks either. Any natural habitat where we could enjoy watching and/or photographing birds, mammals or reptiles in the wild is good. There is no fun in leisure vacations – if you’re going to be in the room or resort for the full day, we might as well do that at a resort in Bangalore. Vacations are to explore and experience, not to laze around all day and watch TV or float in the swimming pool. The stay has to be hygienic, comfortable and more importantly economical. We hardly spend time in our hotel rooms so all the luxury things are a wasted effort. The food has to be basic– we’re no food aficionados who have their menu charted out in the minds even before the meal break. If there’s a place we can drive versus fly or go by train etc – driving takes precedence. There is no substitute for the freedom of being able to choose what you want to do and when. Lastly, there is always a plan and then there’s Plan B.
Ok now, back to the story telling. 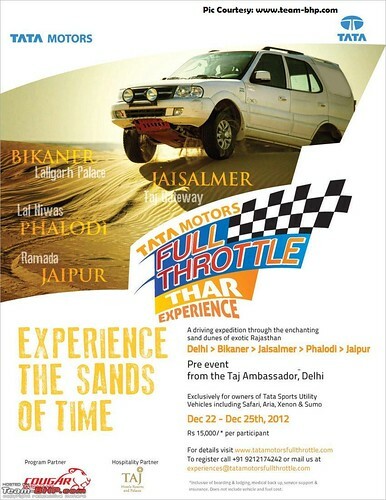 Around the same time in early December we saw that Tata Motors Full Throttle team was arranging a desert expedition starting at Delhi and ending at Jaipur from 22nd-25th . It was a four day event organized for Tata UV owners and the stay options and the pricing was really good. Gozu was a bit excited about this event initially since we were getting a chance to explore Rajasthan (which has been on the list for a while) on a guided but self-driven tour. Owning a Safari and the Thar is going to let us experience the best of both worlds as the TMFT and Mahindra Adventure teams compete in their own ways to put up some really nice events for their customers. I am pretty much sold on the Mahindra Adventure off-road and TSD events and plan to participate to the extent possible in 2013. On the other hand, we’d always prefer solo driving expeditions rather than being a part of a convoy while exploring places and thus the Tour-de-XXXX or Conquer the YYYY type programs are a big no-no. Not that they’re bad, but just that the element of thrill is missing plus you always end up choosing to go with the flow to avoid conflicts. Driving to Delhi for a 4 day event was a really boring idea. There’s absolutely nothing on that route to keep us excited, plus the event was ending on Christmas eve. The following week is the busiest time everywhere and especially in Rajasthan. That meant we may not be able to extend the holiday unless we’re prepared to pay through our nose for the hotel bookings. Besides, except for Jaisalmer where I’d want to go for the sand dunes and the landscapes devoid of people, the rest of Rajasthan though culturally rich with the havelis and history and all of that, it’s a crowded place I think. All our vacations have been with an open agenda for the next day, we never get fussy over following the plan. We only have a rough draft of what we’d like to do and then we just let things flow freely. This is one of the big reasons why we love to drive versus make advance bookings for flights/hotels etc on our vacations. This event was going to be a bit restrictive in that sense as we’ll have to follow a schedule and we were a bit nervous about it. Anyway, we weren’t ready to commit to a schedule as yet and so decided to drop the idea for now. May be we’ll need to start with smaller events and see how that goes. 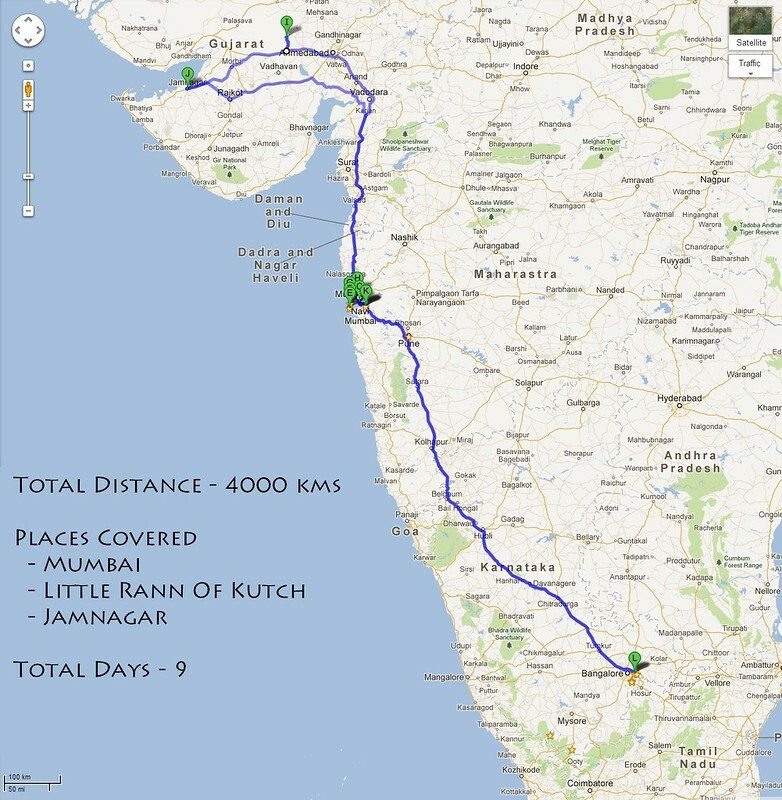 With the Rajasthan plan out of the contention, we started searching for some more alternatives for a week’s vacation. Spending time with extended family in Mumbai and Pune was an option, but that usually turns out to be very dangerous on our weight management practices and at the end of it we’re so exhausted with doing absolutely nothing. Moreover, we’ve had 3-4 trips in this year for various occasions so this plan could be parked for now. Just before we gave up on our choices, another idea came up, why not go back to Gujarat again and spend some time only at the Little Rann of Kutch instead of doing a full-fledged trip like last year. We had skipped a couple of places last year (mainly the Sun Temple and Dholavira), and it would be good to explore them this time around. A quick call to Dhanraj who owns Desert Coursers yielded a positive response and we were now booked for 4 days at Zainabad. We went from no plans to having clear plans within 5 minutes! About a week later I received an invite from the Saevus magazine folks for the Bird-A-Thon that was planned in Jamnagar. Now this was an event originally planned for November, but had gotten delayed and I had no clue that it would pop up now. Luckily, the dates for the event matched our checkout date from LRK and a quick check on Google maps showed Jamnagar to be just under 240kms from Zainabad. This meant that we could leave LRK after breakfast and comfortably make it to Jamnagar by lunch time and participate in the event next day. The Bird-A-Thon was a bird race organized by Saevus magazine along with the Gujarat Tourism and sponsored by Samsonite and Olympus. For those who are new to the bird race concept, it’s not exactly a race where you have chickens running to a finish line. It’s about a group of people roaming through the city limits, trying to spot and identify as many bird species as they can between a 6AM-6PM time window. The team with the highest bird count wins and there may be other awards such as for the rare species that someone has seen or the best picture etc. 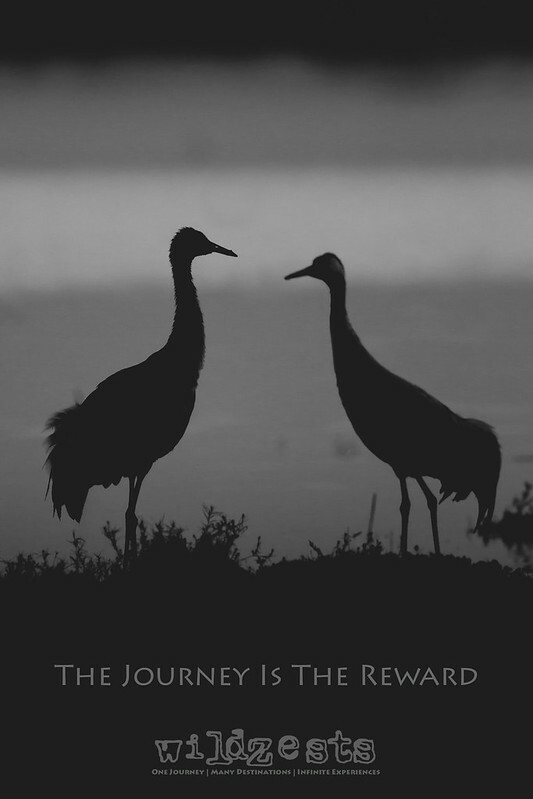 This is however not a photography event and is mainly focused on getting you to explore the bio-diversity of the region and using all resources to identify a bird species so that you can note it down correctly in the log book. The annual HSBC bird race is quite a familiar event and is conducted in a lot of cities. The Bird-A-Thon however, was the first such event being held in Jamnagar and the Saevus team was going to organize stay for the outstation participants, provide cars to move around the city as well design teams with atleast one person familiar with the areas in and around Jamnagar. This was definitely going to be a new experience for me since whenever I’m out for bird photography, the focus has never been to spot as many birds but to spend time with only a few and make sure you have atleast 2-3 shots that you’d be happy with at the end of the day. The new plan was that I’d book a separate room for us and Gozu and Pozu can chill and relax on the day I’m out for the event and we leave for home next day morning and make a stop at Mumbai or Pune if possible. This is exactly what I love about being independent on our vacation, we could easily make amends to our original plan and accommodate the Jamnagar event without any issues. Now, we didn’t just have a vacation plan, I also had a mission for the trip which made it more exciting! Dec 25, 26 and 27: Stay in LRK and explore the Rann. Visit Modhera temple and Dholavira.